All too often, the façade of a building is left to endure the elements, with building owners and facilities managers opting to look after the interior rather than the exterior. We’ve worked on many projects where the buildup of dirt has caused a building’s original materials to become virtually unidentifiable, due most commonly to the 24/7 city lifestyle and the massive pollution created in this environment. When considering a building exterior clean, using a unique system that does not require the use of scaffolding can make the work significantly easier. Business can continue to run as usual, minimising loss of trade, maximising profit potential and maintaining ‘as normal’ day-to-day operations, whatever the business. 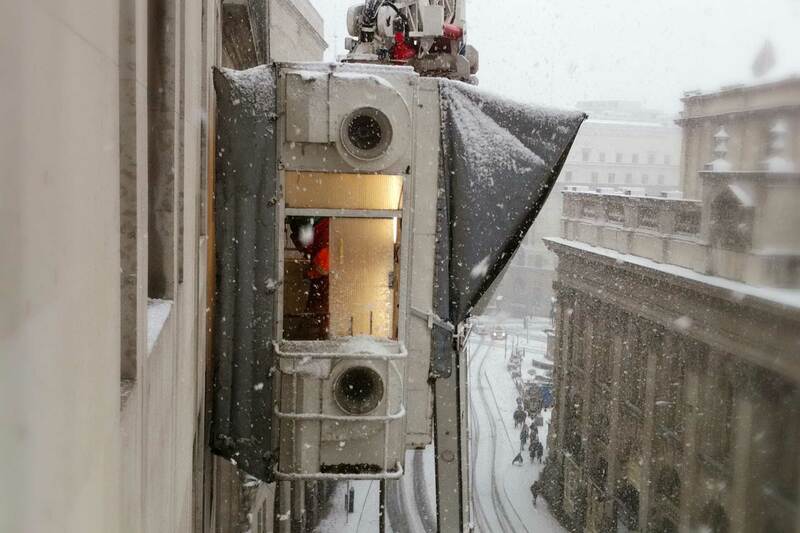 façade gommage® facade cleaning system was created and developed by Thomann-Hanry® in Paris. It is a French term that refers to the process of gently cleaning masonry by projecting very fine powders with low-pressure compressed air. The process starts with an ultra-fine non-abrasive powder dispersed under low pressure along the surface. By moving with the airflow, these low mass particles slowly diminish the dirt with a gentle running action. The airborne particles are then captured in the vacuum cabin and moistened with a water spray before flushed through a hose to a containment system at ground level for recycling. These non-toxic powders are safe for landfill deposit. façade gommage®, more than any other cleaning technique, provides unrivalled results with detailed stonework such as dentils, cornices, modillions, and statues. The powder is so fine it can clean the smallest of crevices with none of the risks associated with pressurised or superheated water. Unlike other traditional techniques, which can have a harmful high impact, the façade gommage® system provides perfect results without damage. Thomann-Hanry®’s façade gommage® facade cleaning system can be especially noticeable when applied to large buildings of 500 sq. m. or more. However, many projects have been undertaken on smaller surfaces with astounding results. To ensure consistent quality control, the materials and equipment we use – together with our all-important on-site application process – adhere to a uniform standard all over the world. These procedures assure our clients that every project using the façade gommage® facade cleaning system will achieve the same impeccable standards. Learn more about the façade cleaning systems on the market through our façade cleaning guide. The guide offers an in-depth look at the traditional façade cleaning methods and their characteristics in order to understand both their benefits and pitfalls. It is an exclusive white paper available for download here. Our specialist cleaning operatives undertake an extensive training programme. On-site, they work with a lightweight vacuum cabin that can be suspended from outriggers or mounted on a hydraulic boom truck, with no need for costly and unsightly scaffolding. The boom can reach up to 42m (12 floors) from ground level. 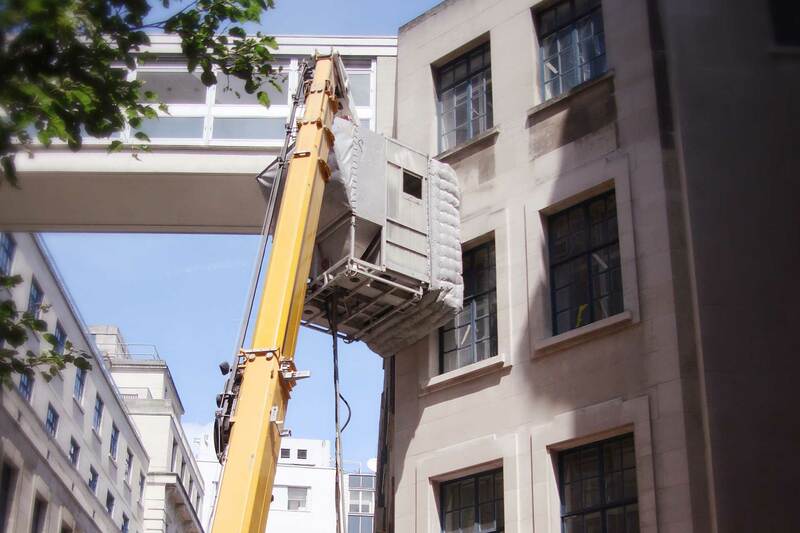 Smaller machines are available for buildings in narrow streets or with other limited access. By gently rubbing dirt away, spectacular results are achieved without collateral damage – a key consideration, especially with older buildings. Unlike water and air-based abrasion techniques, façade gommage® gently rubs masonry, cleaning it with no increase in material roughness. As effective on ornate, carved details as it is on flat surfaces, the process gently lifts grime away, revealing the underlying substrate but leaving it entirely undamaged. The effectiveness of the process also extends to its remarkable reach – applied from an agile hydraulic boom, surfaces inaccessible to other techniques are brought easily within range – up to 14 storeys high – as well as narrow, restricted access areas. 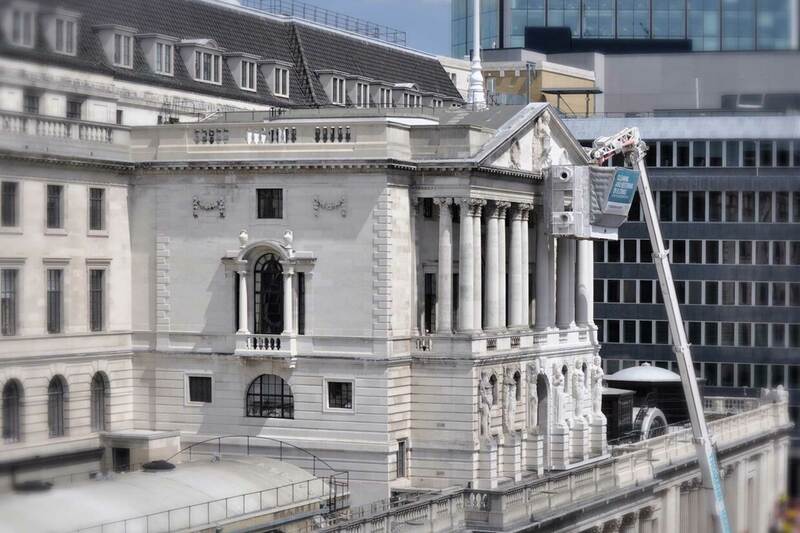 With no need for scaffolding and up and running within two hours of arriving on site, façade gommage® is also overturning preconceptions about the time it takes to clean a building. The process itself achieves blisteringly fast results. Up to 500 sq. m. can be cleaned in one day. As an innovation, the security and safety aspects of façade gommage® set it apart from traditional techniques. At the end of a day’s cleaning, the cabin is simply retracted on its hydraulic boom, leaving building security completely uncompromised. 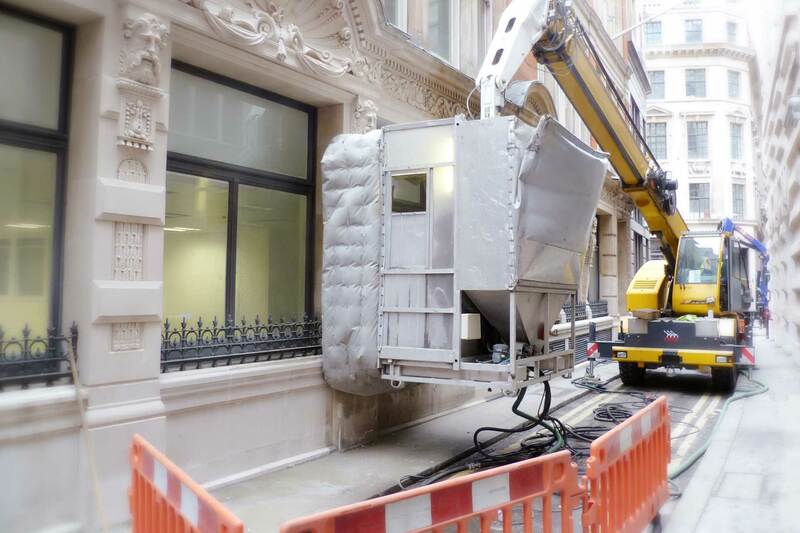 From a Health and Safety perspective, the entire process is contained, unlike DOFF, TORC and nebulous spray techniques, which can inconvenience and potentially endanger passers-by as well as occupants of the building. façade gommage® is a bespoke system globally operated by Thomann-Hanry®’s trained staff and there are no third-parties involved. Trusted by Historic England to restore some of the UK’s most iconic buildings, façade gommage® offers impeccable eco credentials. Unlike chemical and water-based techniques, the process is about as eco-friendly as building cleaning can get. façade gommage® simply uses a bi-product from aluminium smelting – an ultra-fine, inert and non-toxic powder with no chemical properties. Other than a minimal amount of water, which is continuously recycled through the extraction stage of the process to draw off cleaning residues, the only requirement of façade gommage® is power and air, which is supplied from the lorry itself. Our unrivalled façade gommage® facade cleaning system has been approved by Historic England on a number of magnificent projects. If you are concerned about the façade of your building reflecting poorly on your brand values, contact us to arrange a cleaning sample.